1. All materials on this site are protected by copyright and intellectual property laws and are the property of The Pear Tree @ Greenland Place, Yeoman Street, London, SE8 5ET. 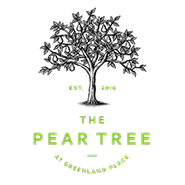 Unless stated otherwise, you may access and download the materials located on www.thepeartreekitchen.co.uk only for personal, non-commercial use. 2. Visitors who use this website and rely on any information do so at their own risk. 3. We are not responsible for the contents or reliability of any other websites to which we provide a link and do not necessarily endorse the views expressed within them. 4. You must not use our website in any way which is unlawful, illegal, fraudulent or harmful, or in connection with any unlawful, illegal, fraudulent or harmful purpose or activity. We accept no responsibility for any loss or harm incurred. 5. We do not warrant that functions available on this website will be uninterrupted or error free, that defects will be corrected, or that the server that makes it available is free of viruses or bugs. You acknowledge that it is your responsibility to implement sufficient procedures and virus checks (including anti-virus and other security checks) to satisfy your particular requirements for the accuracy of data input and output. 6. The laws of England and Wales shall govern your use of the site and you hereby agree to submit to the exclusive jurisdiction of the English courts. Except for death or personal injury caused by our negligence, The Pear Tree @ Greenland Place, its officers, employees, contractors or content providers shall not be liable for any loss or damage arising from or otherwise in connection with your use of www.thepeartreekitchen.co.uk or any information, services or content on www.thepeartreekitchen.co.uk.